Kettunen Center, Michigan’s 4-H leadership training facility near Tustin, Michigan, has offered Environmental and Outdoor Education (EOE) programs since 1988 to help youth, adults and families develop an appreciation of and responsible commitment to the world around them. Now, with support from the Osceola County Community Foundation and the General Mills Foundation/Yoplait of Reed City, Kettunen Center is able to place a higher emphasis on both STEM (science, technology, engineering and math) and healthy lifestyles education within its EOE program. 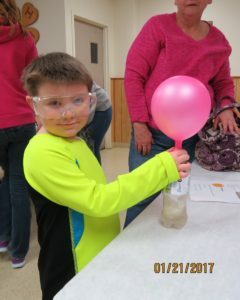 As a result of these grants, Kettunen Center offered two new Winter Days at Kett, day-long events for local families – Messy Science Day and Crafty Kids Day. Messy Science Day was designed for families with pre-K to second-grade children. 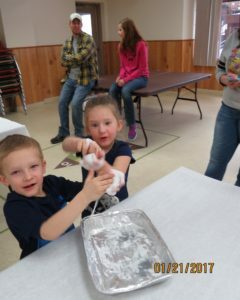 A variety of age-appropriate STEM activities were offered, including making slime, catapults and chemistry experiments. Kids learned about the differences between liquids and solids using everyday items. “It really gives kids a chance to explore some of the basic science principles,” said Laura Jacobson-Pentces, Kettunen Center educational program coordinator. “We’re giving them the chance to experiment, make observations and understand those principles. In addition, Kettunen Center will host students from Reed City, Pine River and Marion schools for the EOE program. “Schools in our area continue to face budgetary challenges, and often field trips are not supported unless they are at reduced to no cost. Research has shown that educational field trips, particularly those that involve experiential learning, have extensions that last long after the field trip has concluded. Having students off-site and out of the boundaries of the classroom allows learning to occur outside of the daily framework,” Jacobson-Pentces said. Fitness as a lifestyle is attainable by all, and according to research, children are more likely to be physically active if their parents/adults are active with them and they are doing activities that they enjoy. “Our EOE program provides gateway experiences for youth, allowing them to explore and pursue physical activity beyond the realm of merely ‘exercise.’ The scope of our EOE program is to model activities for families and adults while encouraging the pursuit of wellness through these activities and showcasing healthy choices for snacking and meals,” she said. According to a STEM report by the U.S. Department of Education, in a world that is becoming increasingly complex, where success is driven not only by what you know but by what you can do with what you know, it’s more important than ever for our youth to be equipped with knowledge and skills to solve tough problems, gather and evaluate evidence, and make sense of information. “This support allows local students to have field-trip experiences that introduce, enhance and support these educational mandates, as well as provide extensions and continued learning beyond the field trip experience,” Jacobson-Pentces said.